Celebration time in extra-time for Dungannon Swifts against Warrenpoint Town. Pic by PressEye Ltd.
Matthew Tipton has urged his Warrenpoint players to dust themselves down and focus on securing promotion to the Danske Bank Premiership. The Championship leaders were narrowly beaten in this Irish Cup quarter-final tie 2-1 after extra-time. But for Tipton cup glory was never the priority this season. He wants to ensure the Co Down side are back among the elite next season, and says that has to be the aim now. “At the beginning of the season our target was to make sure that we won the league,” he said. “We’re on course to do that and I’ve told the players that this is now put to bed. 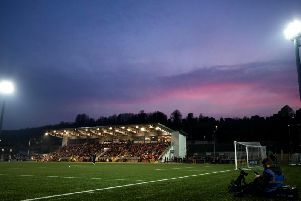 Dungannon will play Linfield in the semi-finals on April 1. Head coach Rodney McAree admitted Warrenpoint had been tough opposition. “It was hard work, we always knew it would be,” he said.